About: Emma Bond Gardens accepts Garden Design, Landscaping and Planting commissions throughout Bristol, Bath, Somerset, Wiltshire and Gloucestershire as well as throughout the South West. We were established in 2000 and have a superb track record. From simple border designs to large country gardens and from contemporary city spaces to traditional period gardens, we offer a complete service including planning, planting and design as well as construction. All of this is undertaken by our team of experienced and creative people. We can transform your garden into a beautiful and stimulating place in which to relax, play and reflect. Our approach is to embrace both the aesthetic as well as the practical. Designs for Landscapes, Gardens and Borders - Small and large designs, including surveys, hand-drawn plans and both hard & soft landscaping. Our experienced landscaping associates can build your garden to either your own plans or to ours. With our extensive experience we can plan, plant and create a stunning garden for you. We can plan all aspects of your garden, helping it to look good all year round. Garden Maintenance - Our experienced team of gardeners can provide all year round maintenance, including lawns and hedges, as well as keeping all areas of your garden clean and tidy. We can do a general overhaul of your garden, including clearing, cleaning terraces and paths, tidying and one-off maintenance. Garden Makeover - We can makeover your garden if you are selling your property and want to give a good impression. 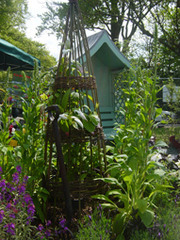 We can also style your garden in various ways for weddings, parties and other special occasions. Products or Services: A company offering Garden Services and Landscaping including Gardening Advice and Tuition, Designs for Landscapes, Gardens and Borders, Landscaping, Planting, Garden Planning, Garden Maintenance, Garden Clearance and Blitz, Garden Pots and Containers and Garden Makeover. Gardeners, Landscapers.